The InSight mission to Mars, the twelfth mission in NASA's Discovery Program, will launch in March of 2016, landing six months later in Elysium Planitia. Unlike previous missions to Mars, which have focused on surface features and chemistry, InSight aims to explore the interior of the planet down to its very core. 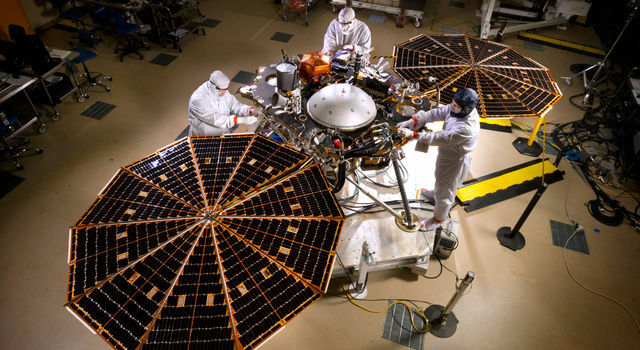 InSight will investigate the fundamental processes of terrestrial planet formation and evolution by performing the first comprehensive surface-based geophysical measurements on Mars. It will provide key information on the composition and structure of an Earth-like planet that has gone through most of the evolutionary stages of the Earth up to plate tectonics. The planet Mars is a keystone in our quest for understanding the early processes of terrestrial planet formation and evolution. Unlike the Earth, its overall structure appears to be relatively unchanged since a few hundred million years after formation. Unlike the Moon, it is large enough that the pressure-temperature conditions within the planet span an appreciable fraction of the terrestrial planet range. Thus the large-scale chemical and structural evidence within Mars should tell us a great deal about the processes of planetary differentiation and heat transport. InSight will pursue these goals using seismology, precision tracking, and heat flow measurements. The limitation to a single location provides challenges to traditional seismology, which can be overcome with the application of single-station techniques that have been developed for terrestrial observations, and to heat flow interpretation, which is spatially variable and thus would prefer many distributed measurements.